Glamorgan ended day two within sight of their first Championship victory of 2016 after forcing Derbyshire to follow on with the visitors 341 runs behind. The visitors were bowled out for just 177 in their first innings with Harvey Hosein's unbeaten 27 the top score. Craig Meschede (3-33) claimed three top-order victims, with all six Glamorgan bowlers taking wickets. Derbyshire showed more resistance second time around, reaching the close at Colwyn Bay on 78-1. Glamorgan remain strong favourites with two days remaining, with young spinners Andrew Salter and Owen Morgan claiming two wickets each in their first Championship match bowling together, while Mark Wallace claimed five catches behind the stumps. Derbyshire wicketkeeper Hosein did emergency opening duty in the second innings, making 26, with captain Billy Godleman away through illness. He is likely to retain his place for the rest of the season after news of Tom Poynton's enforced retirement at the age of 26 as a result of an ankle injury sustained in a car crash. 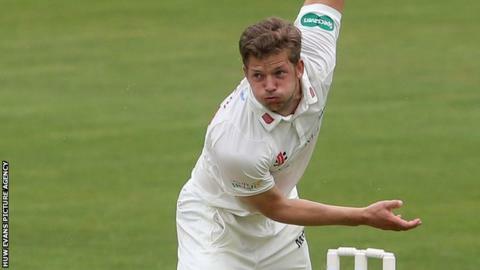 Glamorgan all-rounder Craig Meschede told BBC Wales Sport: "I think the game's going very well, it's in Glamorgan's hands, the boys have toiled really hard to force the follow-on. "Without a doubt it's been the best Championship performance since we haven't started too well in this competition, but we've been playing well leading up to this game and it's nice to see the rewards." Derbyshire head coach John Sadler told BBC Radio Derby: "There's always hope, we're quite a long way behind in the game at the minute but we know that if we play as we can, we might be able to put them under a bit of pressure on the last day. "We know we've under-performed so far with the bat with too many soft dismissals, but we've got another chance to put it right. "I can't speak highly enough of Tom Poynton on and off the field, when you look back, for him to work as hard as he did over that year to get back onto the pitch and play first-class cricket again, credit to him for working so hard - it was an achievement in itself."